As an independent contractor, you are a business of one. This gives you the freedom to make your own schedule, and chart your own career path, which can be exhilarating, and may be one of the reasons you chose to build your own business in the first place. But unlike an employee, whose taxes are automatically deducted from their paycheck, it’s also your job to deduct your own taxes from your earnings. Luckily, you don’t pay taxes on every single dollar you earn. As a self-employed contractor, you pay taxes on the amount you’ve earned minus the costs of running your business. 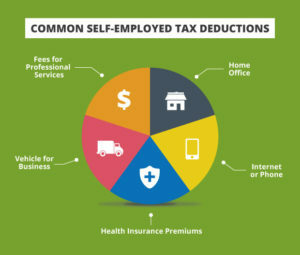 You can claim lots of deductions through an IRS form all self-employed people fill out, called the 1099. Your 1099 independent contractor deductions lower the amount you’ll ultimately have to pay in taxes afterward as a self-employed contractor. Let’s explore 8 categories of independent contractor tax deductions! Note that this advice is illustrative, and is not meant to replace the advice of a professional. Businesses and their tax needs vary, and you should discuss all tax issues with a qualified, licensed professional. Depending on your profession, you may have significant expenses associated with your home office; it could be a yoga studio, a place to store expensive equipment or something else altogether. Is your home office space is used only for work, and it is your primary place of business? If so, there are multiple options for calculating your independent contractor tax deductions in this category. There are direct expenses to consider, like renovations and a paint job, as well as indirect expenses, like insurance, utilities, property taxes, and home repairs. For self-employed entrepreneurs in today’s marketplace, continuing education is extremely important. While coursework can get expensive, all educational expenses are potentially tax-deductible! Webinars, business-related books, and subscriptions to professional publications are all included here as potential deductibles on your 1099. As an independent contractor, it’s likely that you’ve purchased property and equipment for your business. Over time, those items lose value; a printer you bought three years ago is worth less now than it was when you bought it. That’s called depreciation. According to the IRS, if business purchases will last you more than a year, you can write off the depreciation of their value on your tax return. Repairs on property used for your business can potentially be deducted as well. Some self-employed contractors refer to their car as “their office” since they spend so much time there, going from job to job. Car expenses and mileage can be one of the largest tax write-offs for these entrepreneurs. Look into the standard mileage rate to figure out the best method of deducting your car expenses. The rules for calculating the SMR are updated every year, so it’s good to stay current. Tolls and parking are also deductible–for extended meetings or projects, these can add up to a significant out-of-pocket expense for an independent contractor. Keep your receipts, and add them to your 1099! Do you have client meetings out of state, or attend industry conferences? When it comes to business trips, your airfare, hotel costs, and 50% of your meal costs can be written off as business expenses. Even if you extend your trip to travel after the business commitments have ended, you can include those travel costs–just make sure that the amount of leisure days on the trip doesn’t exceed the total amount of business days. For example, if you fly from California to Paris for a 3-day photography conference, you may want to extend your trip for two days of touring. 50% of the costs of meals and accommodations for the extra two days can be deducted, just like the first three days. Do you have one cell phone for both personal use and business? If so, you can write off a portion of your monthly cell phone bill. Similar to your home office, you’ll want to determine what percentage of your phone usage is business vs. personal. You can then deduct that percentage of your phone bill on your 1099 form. Jose hired his wife, Liza, to take care of administrative tasks associated with his auto restoration business. Thanks to Liza’s employee status, Jose was about to provide her with family health care coverage through his business. Her coverage, like his, was 100% deductible. In order to fully focus on your business, you’ll need great contractors insurance. Having contractors insurance can save you money in many ways, and that includes your 1099. Business insurance is one of the tax deductions for contract workers! There are lots of benefits to being a self-employed contractor, and a qualified tax advisor can help you optimize your strategy when filing your 1099 independent contractor income tax deductions. While hiring a tax advisor may seem like an unnecessary cost, the help they provide may save you valuable time, and you can write off their fees as a business expense.